Here’s a Tuesday treat for Jeep fans. A member over at JLWranglerForums.com with the user name Work posted up what appears to be a fully uncovered next-generation Jeep Wrangler, or at least, two-thirds of it. We are given no context for the photo, though judging by what appears to be plastic on the seats and the safety vests being worn by individuals in the background, we’ll assume this shot was hastily snapped in a plant somewhere, perhaps at FCA’s Toledo assembly location. Thus far, pre-production Wranglers have been well-concealed with heavy camouflage draped over the front clip, and now we can see why. A sculpted recess on the fender with an engine bay vent is clearly visible, and we can also see some interesting sculpting and vents on the hood, not unlike the current Rubicon. That would lead us to think we’re looking at a new Rubicon, but the front tire appears to be of the street variety, nor do we see any sort of Rubicon branding. Perhaps this means base model Jeeps will be getting a more dynamic look, as suggested in these renders. 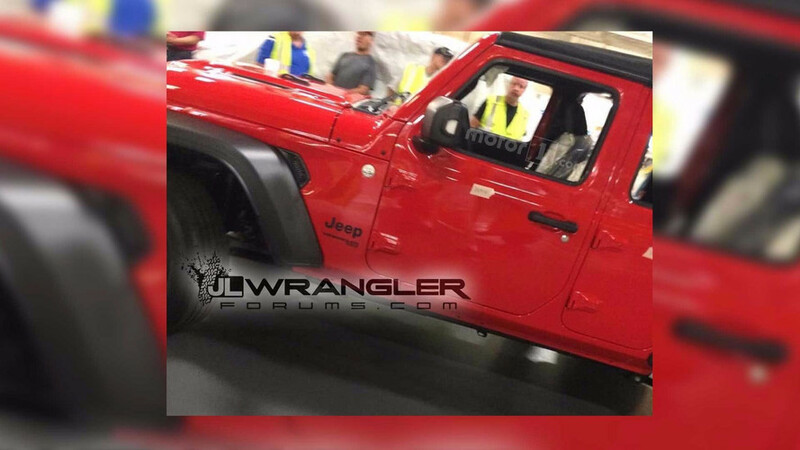 The JLWranglerForums.com crew also tipped us off a few weeks ago on rumors from an FCA dealer meeting, reporting that the new Wrangler would debut at the Los Angeles Auto Show in December. The same report also said dealers would have production models on display shortly thereafter, so if that information is accurate, it’s absolutely feasible to see early production Wranglers in mid-August. When the new off-roader arrives, it’s expected to feature a 3.6-liter V6 with a choice of manual or automatic transmissions, or a turbocharged 2.0-liter four-pot that comes only with the auto. A new diesel mill is also rumored to be in the works, with availability beginning later in 2019.